Before we type any code, we need to inform our game about each achievement (including the name and it’s ID). Remember that Steam offers the Spacewar game as a sample project in order to integrate any platform specific features to our game that hasn’t yet been Greenlit. 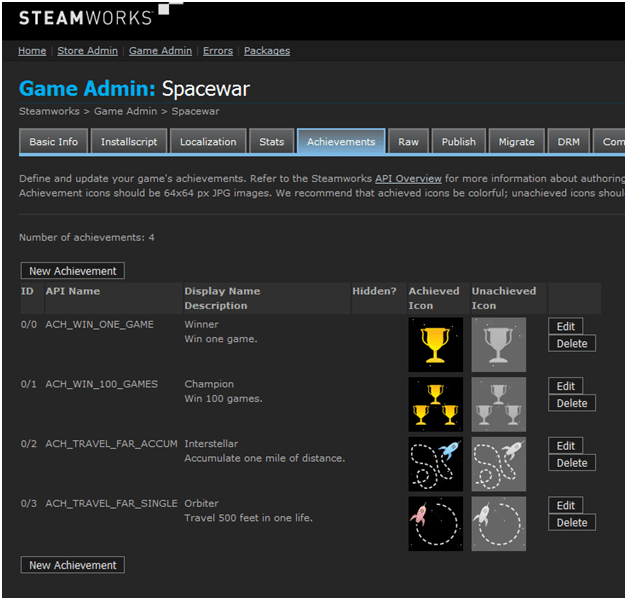 Having said that, we’re going to use Spacewar’s achievements for our game. If your game gets Greenlit, you can add your own achievements. We’re going to cache each achievement when the game starts (BeginPlay). If the player completes an achievement, we’re going to search the cached achievements and if the achievement is valid we’re going to complete it. At this point, launch your game on Standalone mode (this assumes that you have enabled the Online Subsystem Steam plugin which resides in the Online Platform category) and test your achievements! I cant find those headers such as “#include “OnlineStats.h”” ,#include “OnlineAchievementsInterface.h”,etc. My engine version is 4.14.1,Can you help please? That’s weird, have you tried running your project with another version? and then include this inside of the header you plan on doing stuff in. Hopefully that will save someone the few hours it took me to figure it out.